A Ballinderry resident is calling on road safety measures to be introduced on the Haddockstown Road after a car crashed into his garden in the early hours of Friday morning. Robbie Haire was awoken by a large bang and went out to investigate finding bits of debris in his garden and a vehicle had crashed into one of his garden pillars. The scene of the collison on the Haddockstown Road. 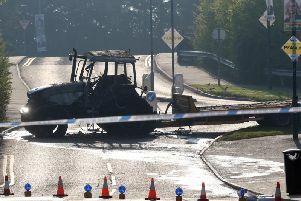 He told the Ulster Star that this collision was the latest in a series of incidents that have occurred on the road. He said: “The most recent was during the early hours of Friday morning when a car crashed into a pillar, the sound was like a bomb going off. “I went out and there was debris absolutely everywhere, a car hit a pillar and it landed in the garden. We have children who play in this garden and I don’t want to think of what could happen if they are in the garden at the time of an accident.